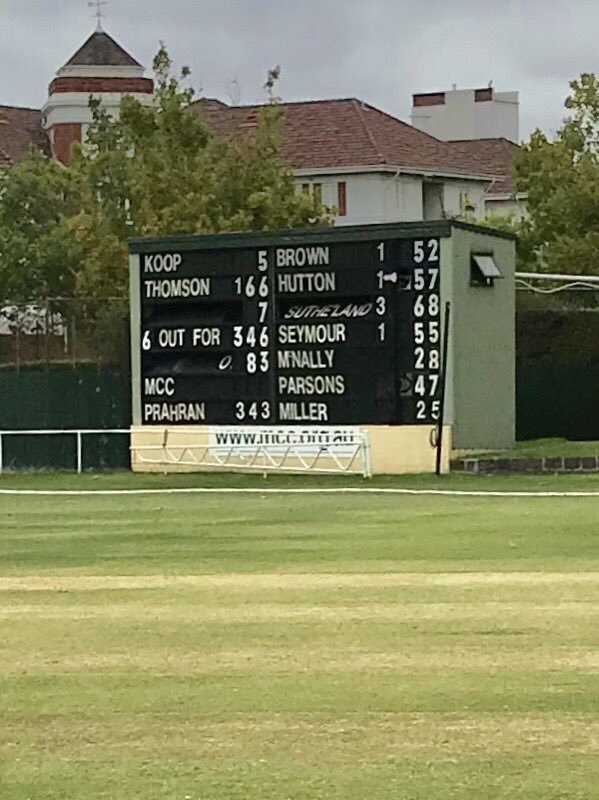 Needing to chase down Prahran’s 343 in 86 overs to keep the 1st XI final’s hopes alive, Blake Thomson played one of the better innings seen for some time (sorry if that is understating it), finishing 166 n.o. in a near five hour stay at the crease where he faced 210 balls, sending 14 of them to the boundary. To do so with so much on the line, it needed more than just skill (that was there for everyone to see) but also great resolve and a deep desire ‘to be there at the end’. Of course you also need willing partners. 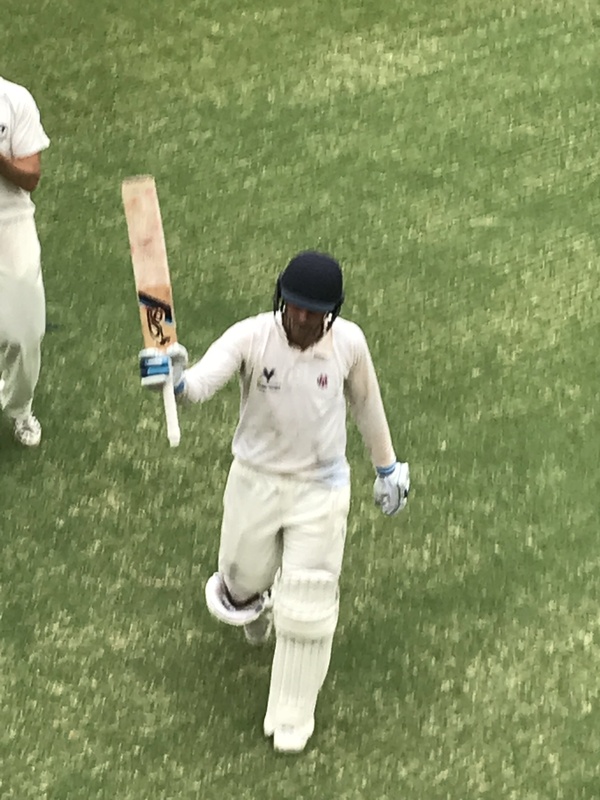 Coming in at 1/31 and seeing his team 3/78, Blake was joined by Meyrick Buchanan (65 of 117 balls) and they set about a positive, but controlled partnership of 141. On Meyrick’s departure, Andre De Lange (40) appeared to feed off Blake’s rock like presence, maintaining the 5-an-over run rate without huge risk. Ollie Gunning (17 at a run a ball) kept the momentum up but it seem fitting at the end that it was Blake who unleashed a powerful pull shot, then followed up with a drive through cover for four to send the balcony into celebration mode. Funnily enough, despite winning the Demons slipped from 9th to 10th on the ladder courtesy of another Monash Tigers outright. However not all results went badly for us. Next week’s final 17th round sees a couple of virtual ‘wild card play-off’ matches with Melbourne (44 pts) playing Footscray at Footscray (5th and just 5 points ahead) and Monash Tigers (7th on 46) playing Melbourne University (9th on 45). Only a freak reverse outright (by Melb Uni) would stop the winners of those two games progressing to finals, with no teams below able to fly over the top of us now. To add a little spice to possible finishing positions, 8th place Geelong (45) play 3rd place Dandenong (52) and probably need to win to keep their spot in the final eight. Second placed Carlton take on Essendon (4th), the Bombers likely needing a win to maintain a home quarter-final advantage. The 2nds made it eight on the trot with a convincing 180-run win. Boldly declaring on their overnight score of 6/362, Kieran Elliot wasted no time sending the Prahran openers packing for the day. From there the Demons managed to pick up wickets just as partnerships threatened to build. Stewart McCooke (2/5) took timely wickets when called on, with Kieran bowling another impressive mid-afternoon spell to finish with 4/52 off 18 overs. Will O’Brien (2/4) completed proceedings to keep Melbourne in 3rd spot, 7 points ahead of 4th. The 3rds, having been slightly embarrassed in being outed for 69 last week and 35 behind on the first innings, turned all that around by winning outright. Matt Short (65 n.o.) and Charles Lill (42) put on a rapid 83 for the 5th wicket that allowed a tea declaration at 5/166, a lead of 131 with a minimum of 41 overs to bowl. A direct hit run out by Lill started the ball rolling our way, a wicket to Scott Gordon and a pair to Max Tucker had Prahran 4/32. Paddy Frawley and Lill chipped in with further wickets but it was Tom Cesaro who was the hero, thundering in for 4/8 off 6.4 overs to seal an outright victory, but gaining just six points after trailing on 1st innings. It gives the 3rds finals chances a heartbeat, sitting 12th and just 6 points behind 6th place Footscray who we play, but with three other teams above us, two of whom play each other, and 7th and 8th playing lowly placed teams. Still, one day that mathematical chance will happen, and an outright won’t hurt our chances either – plenty to play for. The 4ths run of wins come to an end but they stay 3rd, a finals spot assured. Fielding a side weakened by the loss of state players at the top end and other player unavailability’s, conditions were far more difficult in chasing 153. The Demons appeared back on track at 3/105 after some early setbacks with Josh Wooding (35) punishing anything loose, but then came a collapse of 5 for 6 from which they never recovered. The MCC Club XI Division 2 team finished their season off on a winning note. They were well served by Tom Mellick (79) and Luke McCarthy (31 n.o.) in making 7/163. Tom followed up by taking two wickets, as did Matthew Baker and Tom Bischoff, before Jon Baker swooped in with 3/14 to secure a 19-run win. Our Premier girls had a winning double in their one-day rounds, both against Dandenong, sealing finals spots even though there are still two rounds to go. The 1sts were made to work hard for their win. They would have been pleased with their effort with the ball, bowling Dandenong out for 138 in 37 overs. Anna O’Donnell (2/26) got the early breakthrough but it took until Ella Hayward’s (2/27) removal of their state star before we really got on top. Brea Sutton (4/24) then took over to close the innings out. We then found ourselves with a real fight on our hands. Amy Vine (45) was the only top order bat to convert a start and it was left to Tegan Orwin (10 n.o) and Anna O’Donnell (9 n.o.) to put on 21 for the 9th wicket to get the Demons home. The Reserves dominated a 9-player Dandenong (correct me if I’m wrong), and whilst no individual scores have been posted, I have gleaned that Lauren Innes finally cracked the century barrier after recent close misses, making 114 in her sides 2/287 – congratulations Lauren. Dayna Smith took a career best four wickets in Dandenong’s response. Our Shield team fell short by 36 in their chase after Brooke Muscat and Yolanne Carvalho each took two wickets (no batting available). The Shield team plays their final round match next Saturday v Frankston, whilst the penultimate women’s Premier is against Prahran on Sunday (1sts at home). In wrapping up the weekend’s highlights, the Demons once again had stars on the Sheffield Shield stage with Chris Tremain taking 7/82 in WA’s first innings at the WACA, consolidating his spot as the leading wicket-taker in the Sheffield Shield season to date. It was also nice to see Sam Harper back in the navy blue cap, making 38 in the first innings and taking four catches, although it was unfortunate for Seb Gotch who Sam replaced due to illness.